Large faux leather jewellery box with plenty of storage compartments. In this stylish jewellery box ,keep your precious jewellery safe. Mirror approx : 3.08" x 2.25"
OUTSTANDING CRAFT: Made of synthetic leather and soft beige velvet, excellent to keep your jewelry clean, free from scratch or damage. RATIONAL COMPARTMENTS: 4 layers with 3 pull-out drawers, 2 side doors with 8 necklace hooks, 2 ear stud cards, 1 ring roll, 1 mini box, 7 different size pouches. CONSIDERATE DETAILS: Lock with key adds elegance and security; Mirror offers convenience when dressing up yourself; Strong handle on the top allows you to take it wherever you want. 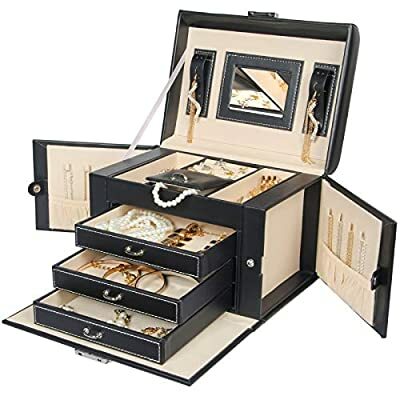 JEWELRY GIFT BOX: Stylish design, ideal for storing necklaces, earrings, bracelets, rings, ear studs, hairpins, cufflinks, brooches and other jewelry, suitable for daily life and business, great gift choice for girls and women. MINI TRAVEL CASE: 9.25''X7.09''X6.50'', portable and space saving, suitable specially for journey and travel. Jewelry not included. Please check the size before your purchase.